Holy Week encapsulates many emotions, events and celebrations: sorrow and joy; Calvary and the Resurrection. At the beginning of the Week, it has been the practice of the South London Fellowship Band to meet together for a meditation on all that Easter means. 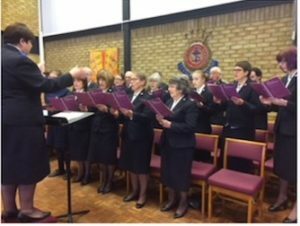 This year, as last, this Meditation was held at the Royal Tunbridge Wells Corps, the Band joining forces with the Royal Tunbridge Wells Songster Brigade and Major Mark Herbert (Divisional Commander, South East). The Band set the scene by playing the hymn tunes Rockingham (When I survey the wondrous cross) and Fewster (When Jesus looked o’er Galilee). This was followed by Eric Ball’s 1959 arrangement of All in the April Evening. As with all Band contributions during the evening, Major Graham Kinsley had expertly arranged for the relevant song texts to be displayed on screen. Major Mark opened the Meditation by inviting us all to listen, to share, to allow our souls to respond to the music – music that will stir things within that only God can inspire. The congregation was then invited to join in Albert Orsborn’s immortal words I know thee who thou art. A second opportunity for all to sing was later given with the Welsh Revival hymn Here is love vast as the ocean. In the love of Jesus was first published as a vocal solo in 1961, although the melody, by William Hammond dates back to 1946. 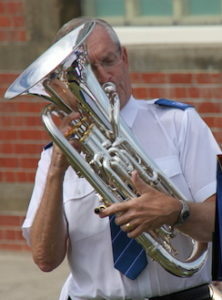 In arranging this for Hendon Band, Kenneth Downie writes “…I tried to meet the challenge of keeping the charm of Hammond’s melody and at the same time look for another layer of beauty, which might emerge from other aspects of the music.” This was followed by a Euphonium solo, Precious Jesus, sensitively played by the Band’s principal euphonium, Adrian Horwood – the arrangement being from the pen of Robert Redhead, based on Mervyn Clarke’s 1976 songster composition of the same name. Morley Calvert (1928-1991) has just 14 brass compositions listed by The Salvation Army, many of them gems in the SA repertoire including his arrangement of My all is on the altar which was one of his earliest from 1954 and featured by the Band this evening. The trombone section later featured Dirk Krommenhoek’s arrangement of From that sacred hill. 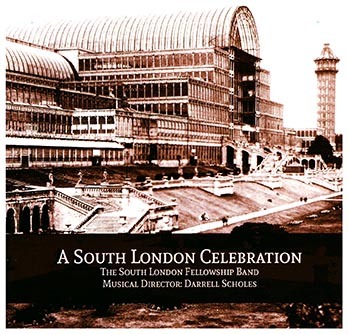 A number of the musical contributions were based on folk melodies. 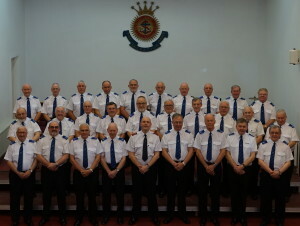 The Songsters, under the leadership of Songster Leader Hazel Edwards, presented General Orsborn’s words The Charm of the Cross which had been married to an American-Irish melody, Mother Machree, by Norman Bearcroft, initially for use by the (then) newly-formed International Staff Songsters. Michael Wickham then conducted the Songsters in Isaac Watts words – When I survey the wondrous cross – which has been combined with an old Scottish melody O waly waly in an arrangement by Cliff Mathews. Towards the end of the evening, the Band featured The Christ of Calvary, an arrangement by Mervyn Clarke of the 18th century Scottish melody Annie Laurie. Major Mark brought to us a Scripture passage from Isaiah 53, choosing the beauty of the King James Version and highlighting part of verse 3: and we esteemed him not. He challenged everyone present: What kind of King is this? We esteemed him not – we gave him no value, no thought, no priority in or lives. Yet he longs for his “subjects” to love him and waits by the gates of heaven day after day – the invitation that God gives to be in a relationship with him.